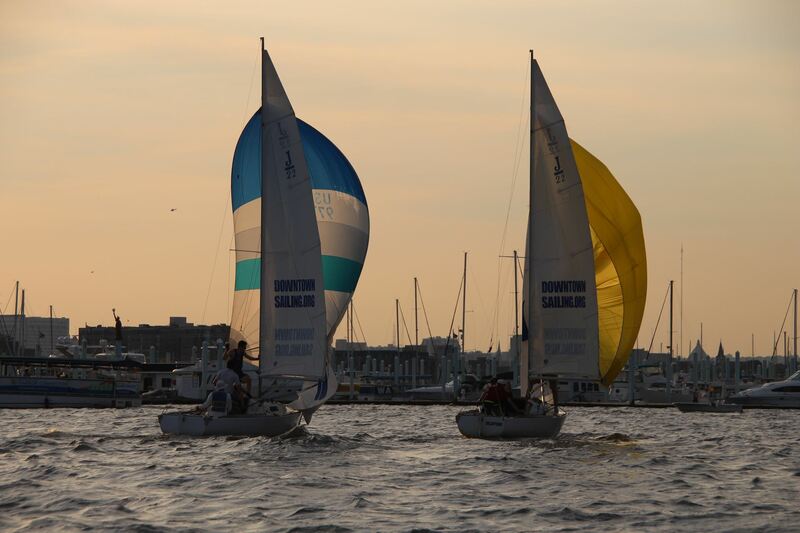 The Thursday Night Racing (TNR) Program promotes core Downtown Sailing Center (DSC) values of diversity, camaraderie, sportsmanship, and education through the sport of sailing. Welcome to the exciting world of racing! More information about racing at Downtown Sailing can be found in PDF format HERE. Click HERE for the TNR Official Notice Board. If you are interested in racing, please email john@downtownsailing.org or call the office. Don't be late to the line! Sailors who sign up at the race crew level can join a J/22 Spinnaker Class racing team led by two or more racing skippers. Each race team, comprised of 6 or more members, splits the burden of sailing and running Race Committee through the season. J/22 Spinnaker Class Racing spots are available beginning in November of the previous year. Please be aware that you should join a team before paying the racing upgrade fee. New for 2019! The TNR program is running a second Non-Spinnaker Start for the Sonar Class boats. Available at no upgrade or series fee, any skipper can begin to hone their skills for racing. Also New for 2019! If you fail to renew your racing upgrade when you renew your membership, you can purchase your upgrade by going to the TNR Official Notice Board. Thursday Night Racing Program 2019 Info Now Available! Cut your racing chops through DSC Frostbiting and informal summer "Friday Fun Races." Frostbiting is typically organized by the office throughout the winter, while Friday Fun races are true pickup races where skippers and crew meet up to sail out into the summer sunset. Check out the Racing Calendar for all the frostbite and Fun Race dates.